In June 2014 James Hill launched The Ukulele Way. It is a great concept! 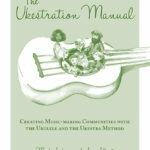 We are chuffed to be a distributor in Australia for The Ukulele Way books. We are also participating pretty strongly in the free online community. Join and Participate for Free! The community is free to join (it looks pretty much like Facebook, without the data mining, privacy compromises and advertisements!). It’s a way for you to connect with other ukulele players and teachers – locally, nationally or internationally. At the heart of The Ukulele Way is a series of six books that teach you how to play melody, harmony and rhythm simultaneously. Renowned performer and teacher James Hill de-mystifies this musical juggling act step-by-step with clear, well-organised lessons, helpful exercises and a wide selection of repertoire. Of course, technique without repertoire is no fun so The Ukulele Way includes a wide range of popular, traditional, jazz and classical arrangements, each recorded by James on the Companion CD (included). In Australia we only sell the books in C6 tuning. Each book contains re-entrant (high G my dog has fleas) and linear tuning versions (low g). All books retail for AUD$23 (currently only by direct deposit to our Australian bank account). Postage and handling extra. Songs in Level 2 include: Buffalo Girls; Carnival of Venice (interlaced); Carnival of Venice (synchronous); All Night Long (synchronous); Li’l Liza Jane. Book 4 came out in November 2014 – it covers The Harmonized C Scale; Harmonizing a Melody; The Triple Strum; Harmonizing in F, Fingerpicking, The Dominant 7 Chord. Santa Lucia, El Tortillero, Slumber Song, Ah! Si mon moine voulait danser, Spring (First Movement Theme), When Irish Eyes Are Smiling, Drink to Me Only With Thine Eyes in 2 variations are the included arrangements. Book 5 focuses on chromatic melody and harmony, including lessons on the chromatic scale and secondary dominant 7 chords. Repertoire includes: Capital Blues, Ciribiribin, two pieces by Mozart (German Dance and Minuet from Don Giovanni), Spring Song (Mendelssohn), a fun and challenging arrangement of I’ve Been Working on the Railroad plus a fingerstyle arrangement of the classic jazz standard Ja-Da! We’ll be more than happy to help, from right here, in Australia.